In the years surrounding the revolutionary period France was one of the richest and most powerful nations on earth. The French people used their great levels of freedom to become the philosophical center of the enlightenment. The Duke d’Orleans would create a private, open air mall-type area called Palais Royal that was popular among the people due to its cafes and bars that often served people in tables on the sidewalks. While this was a beautiful location, it would soon become a safe haven for public debates due to it being the private property of the Duke. This meant that the Kings guards weren’t allowed to police the area, and therefore people were allowed to speak openly and freely about any subject. These debates became much more negative in terms of the monarchy as time progressed, and especially after those that had fought in America returned. The idea of freedom had aroused curiosity, but it was clear that the situation in France was very different than America. France was seen as the strongest and most stable monarchy in Europe, and had been the model for other monarchs. 1614 to be forced to call the Estates General for help. The peasants of France were in a much tougher situation than others were since they paid the majority of the taxes, and still kept having nobles try to weasel more money out of them for some fee connected with housing. Most would end up paying around 80% of their income on simply buying bread during this time, and were outlawed from hunting for food since that was the right of the King. To make matters worse, the peasants really had no possibility of changing the situation they were in because they had no real power in government, despite representing around 96% of the population. 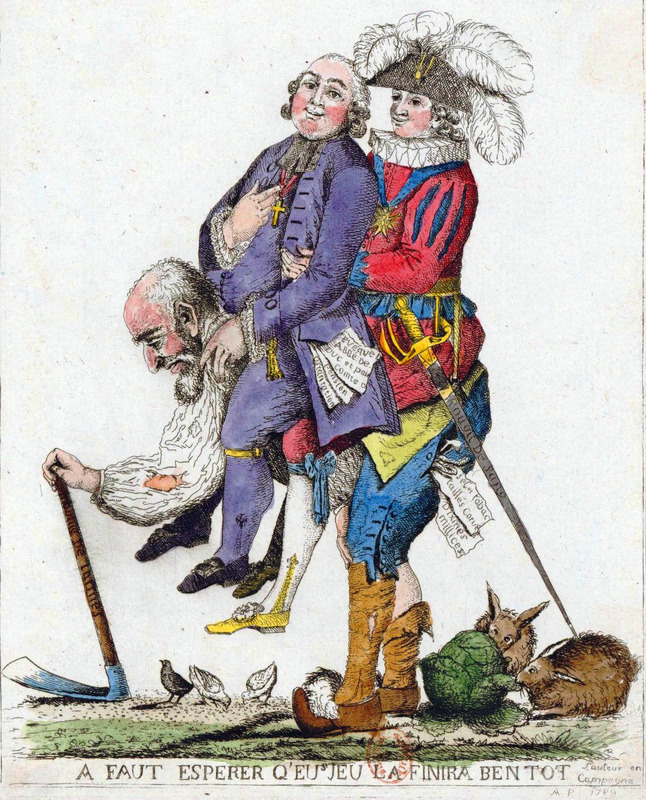 France had long been set up in a hierarchy known as the Estate System, where the power within the Estates General was divided among the social classes. The system was set up in a way that each group was allowed to have 1/3rd of the vote despite the numbers of representation being so lopsided in favor of the 3rd Estate. What normally happened was that the first 2 Estates would simply combine to outvote any changes the 3rd Estate wanted, thus keeping the power in their own hands. This is still seen as one of the least fair systems of government in recent history and had a great deal to do with what was to come.